Woodford County is a county located in the U.S. state of Kentucky. As of the 2010 census, the population was 24,939. Its county seat is Versailles. 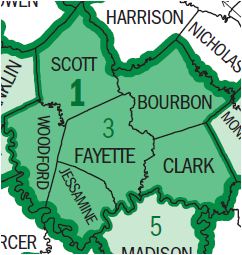 Woodford County is part of the Lexington-Fayette, KY Metropolitan Statistical Area. It is located in the heart of the Bluegrass region of Kentucky. The county was formed from a part of Fayette County, Virginia in 1788. It was named for William Woodford, an American Revolutionary War general from Virginia who died while a prisoner of war in 1780. It was the last of the original nine counties established that formed the Commonwealth of Kentucky in 1792. Scott County was formed from part of the county in 1792. Franklin County took another part of the county in 1794. Queen Elizabeth II stayed in Woodford County at Lane's End Farm in May 2007. She also attended the Kentucky Derby in Louisville. According to the U.S. Census Bureau, the county has a total area of 192 square miles (500 km2), of which 189 square miles (490 km2) is land and 3.3 square miles (8.5 km2) (1.7%) is water. As of the census of 2000, there were 23,208 people, 8,893 households, and 6,643 families residing in the county. The population density was 122 per square mile (47 /km2). There were 9,374 housing units at an average density of 49 per square mile (19 /km2). The racial makeup of the county was 92.08% White, 5.41% Black or African American, 0.13% Native American, 0.31% Asian, 0.01% Pacific Islander, 1.13% from other races, and 0.93% from two or more races. 2.99% of the population were Hispanic or Latino of any race. There were 8,893 households out of which 35.00% had children under the age of 18 living with them, 61.90% were married couples living together, 9.70% had a female householder with no husband present, and 25.30% were non-families. 21.00% of all households were made up of individuals and 7.50% had someone living alone who was 65 years of age or older. The average household size was 2.57 and the average family size was 2.99. In the county, the population was spread out with 25.40% under the age of 18, 7.90% from 18 to 24, 31.20% from 25 to 44, 25.10% from 45 to 64, and 10.40% who were 65 years of age or older. The median age was 37 years. For every 100 females there were 93.00 males. For every 100 females age 18 and over, there were 91.20 males. The median income for a household in the county was $49,491, and the median income for a family was $58,218. Males had a median income of $39,284 versus $27,972 for females. The per capita income for the county was $22,839. About 5.20% of families and 7.30% of the population were below the poverty line, including 8.00% of those under age 18 and 13.10% of those age 65 or over. Woodford County is home to Kentucky's oldest bourbon whiskey distillery, Labrot & Graham (established 1812), maker of Woodford Reserve; and to the Life Adventure Center, the Weisenberger flour mill, Castle post hotel, and the former Old Taylor Distillery. ^ a b "State & County QuickFacts". United States Census Bureau. http://quickfacts.census.gov/qfd/states/21/21239.html. Retrieved March 6, 2014. ^ "Woodford County". The Kentucky Encyclopedia. 2000. http://www.kyenc.org/entry/w/WOODF01.html. Retrieved August 23, 2014. ^ Railey, William Edward (1938). History of Woodford County, Kentucky. Genealogical Publishing Com. p. 91. https://books.google.com/books?id=43jEKg6VTLYC&pg=PA91&lpg=PA91&dq=John+Buford+woodford+county+ky&source=bl&ots=bmpZNC-9y5&sig=k5h2ctQ51RkXMr97E6QjqlFlf3I&hl=en&sa=X&ei=dS7HU8rvBsTu8AHvl4CIAQ&ved=0CEEQ6AEwBA#v=onepage&q=John%20Buford%20woodford%20county%20ky&f=false. Retrieved 17 July 2014. ^ Kleber, John E. (1992). The Kentucky Encyclopedia. University Press of Kentucky. p. 179. https://books.google.com/books?id=8eFSK4o--M0C&pg=PA179&dq=Albert+Benjamin+%22Happy%22+Chandler,+Sr.+woodford+county+ky&hl=en&sa=X&ei=bS_HU9TKIemr8AG00IDADQ&ved=0CB4Q6AEwAA#v=onepage&q=Albert%20Benjamin%20%22Happy%22%20Chandler%2C%20Sr.%20woodford%20county%20ky&f=false. Retrieved 17 July 2014. ^ "Ben Chandler is named director of Kentucky Humanities Council". Kentucky.com. http://www.kentucky.com/2013/05/10/2635712/ben-chandler-named-director-of.html. Retrieved July 16, 2014. ^ Evans, Clement Anselm (1899). Johnston, J. S.; Kentucky. Moore, J. C.; Missouri. Confederate Publishing Company. p. 238. https://books.google.com/books?id=U44vAAAAYAAJ&pg=PA238&dq=Charles+W.+Field+woodford+county+ky&hl=en&sa=X&ei=IDHHU7XwCqXn8AHExoGICw&ved=0CCIQ6AEwAQ#v=onepage&q=Charles%20W.%20Field%20woodford%20county%20ky&f=false. Retrieved 17 July 2014. ^ Railey, William Edward (1938). History of Woodford County, Kentucky. Genealogical Publishing Com. p. 179. https://books.google.com/books?id=43jEKg6VTLYC&pg=PA276&lpg=PA276&dq=Charles+Scott+woodford+county+ky&source=bl&ots=bmpZNC09z9&sig=p0Le114_fw9SvbYEDvyWwP9LEFE&hl=en&sa=X&ei=ajLHU6ylMcWu8AHm74GoDw&ved=0CEQQ6AEwBA#v=onepage&q=Charles%20Scott%20woodford%20county%20ky&f=false. Retrieved 17 July 2014. ^ Railey, William Edward (1938). History of Woodford County, Kentucky. Genealogical Publishing Com. p. 276. https://books.google.com/books?id=43jEKg6VTLYC&pg=PA276&lpg=PA276&dq=Charles+Scott+woodford+county+ky&source=bl&ots=bmpZNC09z9&sig=p0Le114_fw9SvbYEDvyWwP9LEFE&hl=en&sa=X&ei=ajLHU6ylMcWu8AHm74GoDw&ved=0CEQQ6AEwBA#v=onepage&q=Charles%20Scott%20woodford%20county%20ky&f=false. Retrieved 17 July 2014. ^ "TRIMBLE, William Allen, (1786 - 1821)". Biographical Directory of the United States Congress. http://bioguide.congress.gov/scripts/biodisplay.pl?index=T000377. Retrieved July 16, 2014. This page uses content from the English language Wikipedia. The original content was at Woodford County, Kentucky. The list of authors can be seen in the page history. As with this Familypedia wiki, the content of Wikipedia is available under the Creative Commons License.